CARPE DIEM: Donor Compensation, Not Kidney Swaps, is the Only Solution to Growing Kidney Shortage in U.S.
Donor Compensation, Not Kidney Swaps, is the Only Solution to Growing Kidney Shortage in U.S.
Saturday's New York Times article "60 Lives, 30 Kidneys, All Linked" features "the longest chain of kidney transplants ever constructed, linking 30 people who were willing to give up an organ with 30 who might have died without one." The article has been getting a lot of attention and is currently the second most e-mailed NY Times article and fourth most viewed. Such organ exchanges are a godsend for sick people with loved ones who are willing to give them a kidney but are not biologically compatible with them. In an exchange, unmatched couples switch partners to form compatible pairs. But now for the bad medical news. 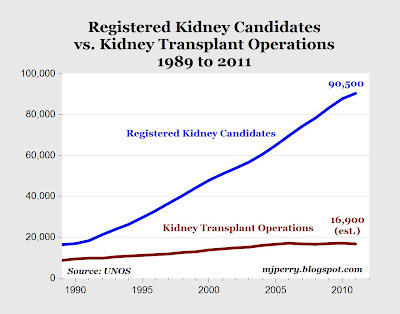 There are more than 90,000 Americans with renal failure on the national waiting list for kidneys, a grim new high (see top chart above). Almost 13 patients on the waiting list die each day. In addition, almost 7 people are removed each day from the waiting list because they are too sick to survive a transplant operation. As ingenious, painstaking and justifiably attention-getting as domino swaps are, they shouldn't blot out the dismal news that rates of kidney donation, from both living and deceased donors, fall woefully short of the need. 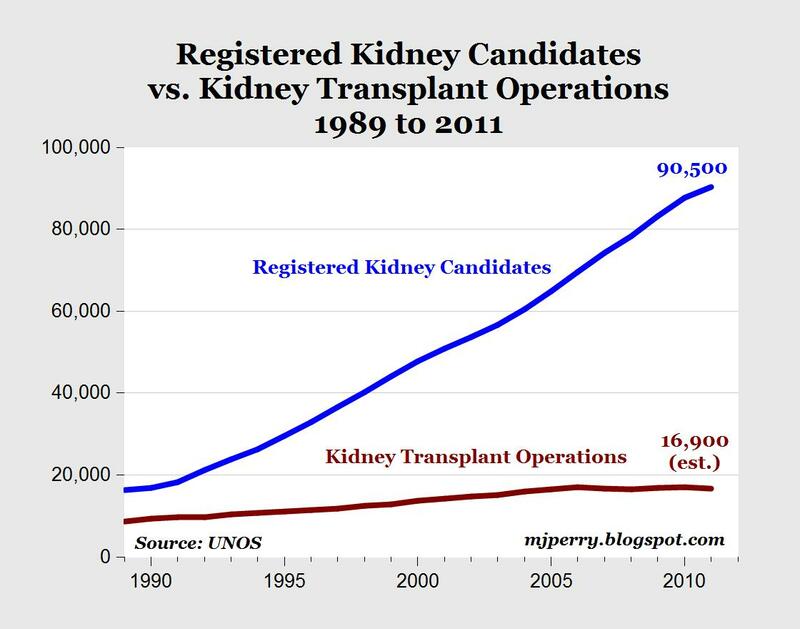 As the number of renal transplant operations remains mired between 16,000 and 17,000 a year, the number of candidates on the waiting list mounts. Within the last seven years, for example, the list grew by 50%, from about 60,000 patients in 2004 to 90,500 at the end of last year. This means that only one kidney transplant operation was performed in 2011 for every 5.4 needy patients, making the chance last year of getting an organ less than one in five -- an all-time low of only 18.5%. 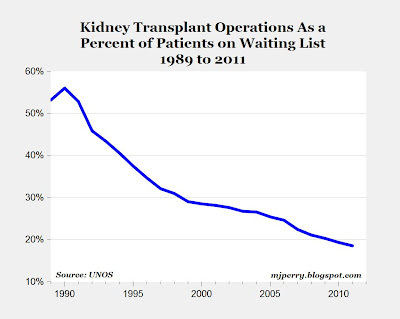 As recently as the early 1990s, patients on the waiting list had a greater than 50 percent chance of receiving a kidney in a given year, but the situation has worsened every year since 1991 (see bottom chart). Thus, even if surgeons were able to schedule an additional 30-kidney swap operation every day this year, more than 62,000 patients would still languish on dialysis, facing premature death. The only realistic long-term solution to the growing kidney shortage in the United States is not kidney swaps, but rather it is to allow some form of donor compensation (which was never mentioned in the NY Times article). This would require Congress to amend the National Organ Transplant Act of 1984 so that people who give organs could receive a benefit, perhaps a tax credit, tuition voucher, lifetime health coverage or a contribution to a retirement plan. Such compensation would be regulated by the government, with kidneys allocated to ill patients according to the national formula being used across the country. We should surely celebrate the world's largest-ever 30-kidney exchange and hope that more of them occur. Yet we shouldn't lose sight of the reality that the most promising long-run solution to the kidney shortage is a system of donor compensation. Until now, Israel ranked at the bottom of Western countries on organ donation. Jewish law proscribes desecration of the dead, which has been interpreted by many to mean that Judaism prohibits organ donation. Additionally, there were rabbinic issues surrounding the concept of brain death, the state in which organs are typically harvested. As a result, many patients died waiting for organs. The response was overwhelming, as people registered in droves as potential donors. “We were swamped,” says Tamar Ashkenazi, the director of the National Transplant Center of Israel. The machine that prints the organ donation cards usually handles 3,000 a month — 5,000 if two workers are dedicated full-time to operating it. During the 10 weeks of the publicity campaign, 70,000 Israelis registered for organ donation cards. Swaps remind me of what a wag said about that old commercial "shrinks hemorroidal tissue" in which size is shown as arms outstretched and shrinkage as hands brought 1 foot apart. If that's your problem, that's not a solution. what is wrong with the approach Che highighted? and - on a worldwide basis - are there any countries that allow what Mark Perry is advocating? what is the state of organ markets in the world? The "swap" facet brings new light to justifying donor compensation or flat out organ sales. A great many of the people who "sell" their organs could be those who are trying to afford buying an organ for a loved one. The silly and archaic barter method government forces on people who want to trade organs is literally killing people. The naysayers' predictions of predatory organ harvesters ring hollow. If legal competition for facilitating trades in organs is allowed, are would-be organ-sellers going to go to the seedy, back-alley place that offers them more money, but has a bad reputation, or to the hospital-affiliated operation that's insured and backed by reputable ratings agencies? Does anyone think that the organ donation problem is going to be exempt from the law of supply & demand? Why has the number of kidney candidates been rising in the first place? Population, diets? Seth: "Why has the number of kidney candidates been rising in the first place? Population, diets?" Advances in medical treatment keep more candidates alive? juandos: "Does anyone think that the organ donation problem is going to be exempt from the law of supply & demand?" Apparently some do. Like anything for which there's a demand, we find a market, or black market wherever restrictions apply. Since commodity money based on gold seems so controversial, perhaps a kidney based currency would be a better choice. Talk about economic justice and equality! That would give additional meaning to the phrase "all men are created equal. And are endowed by their creator with...two kidneys. what is the valid rationale for the government to tell you what you can do with your own organs? clearly, they are your property. so why can't you sell them if you want to? you can sell your hair. why interfere with a market? why deny basic rights? i know some will say "well, desperate people will be forced to", but that argument is nonsense. it's just another option. no one can force you. all it does is give choice. describing giving more options as oppressive is the most despicable kind of paternalistic fascism. and please, no ridiculous fantasies about organ theft. that's VERY easy to prevent and it has not happened in places like iran where kidney sales are legal nor around other biological commodities that can be sold for big money. it's legal to sell eggs. i know a woman who sold 4 and paid for her entire degree at stanford that way. they are VERY valuable from the right donor. but promising young women are not grabbed off the street and mugged for eggs, so these "kidney theft" fantasies are just groundless hysteria. what is the state of organ markets in the world?" As is all too common, Larry has trouble with numbers, and adds up 3 questions and gets a sum of 2. 1. Nothing as far as it goes. It's a step in the right direction, and may work well in Israel. For others, mileage may vary. 2. Yes - Iran - and it works very well. Without going off on some other subject, please confine your response to kidneys and transplants only. 3. Most organ markets in the world are black markets, and far more dangerous and expensive than than open, free markets would be. so...nowhere in the world other than in Iran is there any system different than the one in effect in the US? you'd think in the entire world - there would be at least SOME OTHER ways, right? at this point.. it seems that all we really know is how the US system works and not much about any other systems. remember, there are over 200 other countries in the world including several dozen industrialized countries. is this a situation where all we really know is how things work here? Well, as we saw, Israel has one different. Everyone does things differently, but the vast majority all center around donations, like the US system. As to why, well, the sale of organs is considered... distasteful. Many cultures object to it on many different grounds. Before any serious discussions of having a legal organ market can take place, these concerns need to be addressed. Just because a culture objects to something doesn't mean it's not useful or should be banned. Don't forget that it was once unacceptable (and still is in some places) for women to read or to work. It was once a heresy to sing and dance in Massachusetts. Both of which can easily be replaced about as fast as you sell them. Whole organs do not just grow back. The only possible way to get that is to let science solve this problem through the development of organ cloning. "at this point.. it seems that all we really know is how the US system works and not much about any other systems." As I expected, your comment isn't really confined to kidneys and transplants, but I will give you a brief answer. What we know, is that people in Iran can sell organs to those that need them, and the system appears to work very well. 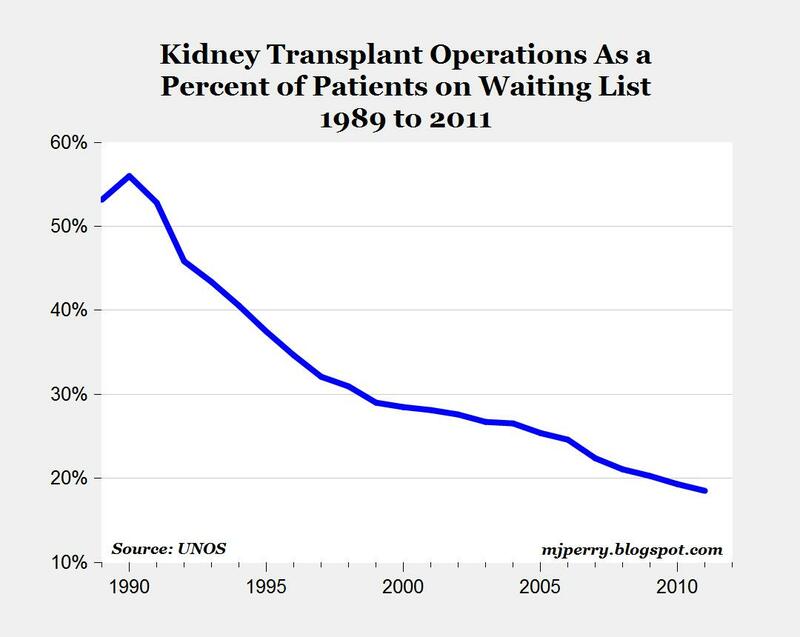 Unlike most other countries, there are no large numbers of people waiting for kidneys, and few, if any, dying while waiting for them. Supply and demand are working, when allowed to. well.. no.. my comments ARE restricted to kidney transplants and I do agree that the current approach is not a good one and that there has to be a better way. but you would think that somewhere in the world there are other systems that work maybe differently. My attitude is that just understanding how other countries do it differently might help develop a deeper understanding. I'm not familiar with Iran nor Israel's approaches.. but for that matter not Europe or Asia either. Oh my ron h! Now that was just outstanding! "I would not point to Iran as a model though..."
The Iranian "model" of paying donors for their kidneys provides a sufficient supply to meet demand. The illegality of this market in much of the rest of the world keeps supply way below demand, so that people who would otherwise be saved, are allowed to die. What else would you need to know about it? "but you would think that somewhere in the world there are other systems that work maybe differently." Systems? There are either enough donors because they are incented to provide a kidney, or there aren't. Payment seems to provide a big incentive. The Isreali system appears to provide payment to donors in the form of preferential medical treatment. There are some obvious limits to this idea. juandos: "how many people get the uncomfortable feeling that selling organs might be somehow just a short step from cannibalism?... :-)"
I can already give away an organ, why can't I sell it? Also morganovich's example of a woman selling eggs is closer to an organ sale than hair or blood. Eggs aren't replaced either. juandos: "I don't know about where you're at but some of the state government's finest employees work the DMC racket here in Missouri and wow do they give you the 'evil eye' if you don't check off on the 'voluntary' organ donation line when renewing the driver's license..."
You must not be aware that it doesn't count if you cross your fingers behind your back while checking off the donor box. I thought evil eye was the only look available to DMV employees. I've never seen anything else. I also suspect that if you got a better offer for your kidneys, and made another arrangement, it would override the State's right to direct the use of your kidneys. Renegade Aspen Cabbie Back in "Business"